Come meet fellow anime fans and enjoy fun games, snacks, crafts and watch some new anime. Recommended for ages 12+. 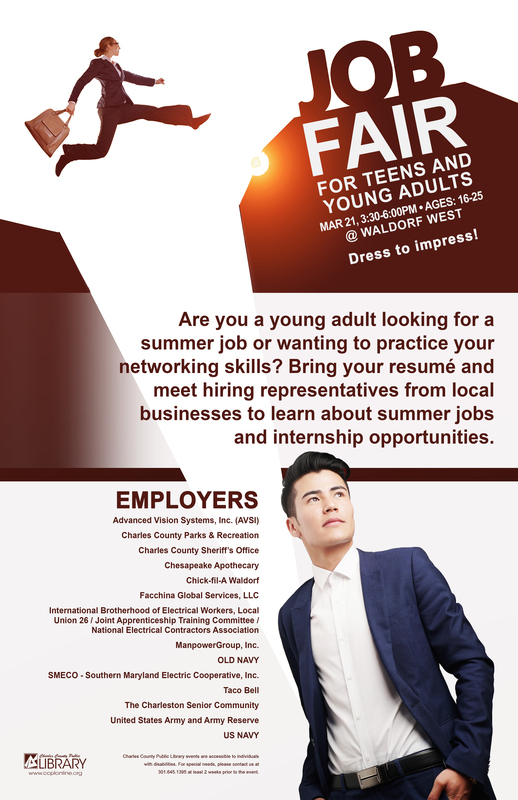 Are you a young adult (ages 16-24) looking for a summer job or just want to practice your networking skills? Bring your resume' and join us at Waldorf West Library. Meet representatives from local businesses to learn about summer jobs and internship opportunities. Dress to impress. Recommended for ages 16-24. Come to our Spanish Club and make "new amigos" as you practice speaking, discover new phrases and finally figure out verb conjugations! Basic Spanish vocabulary and conjugations skills required. Is sewing your thing, but you don't have a sewing machine or don't have a sewing space to start creating? Come to our Sewing Lounge! We'll have our three machines ready for you to start on your new project. First-come, first-served. Join us for a morning of art history and a hands on art project. Attendees will learn about Joseph Mallord William Turner, what made his art so unique, and create their own one-of-a-kind art inspired by Turner. Older students can join us for fun, learning, and socializing as we explore STEM themes. In April we will be learning about Ocean Acidification. Join us for a thought provoking discussion on how to develop and maintain boundaries with new and existing relationships. We will discuss what appropriate barriers look like and how perpetrators use “grooming” to ultimately gain the trust of a victim in order to silence them. Celebrate Poetry Month and create your own blackout poetry, then perform your piece. Materials provided and take home your work after or leave it for us to display. Genealogy’s popularity has increased significantly over the past several years, with new devotees gaining an introduction through shows like Genealogy Roadshow, Who Do You Think You Are?, and Finding Your Roots. Are you interested in joining the ever-growing community of researchers? Join us as we talk about the first steps you should consider taking to begin researching your ancestors, look at resources you can use—both online and in print, and discuss institutions you should consider planning to visit.